On February 23, 1909, the pioneering efforts of Dr. Alexander Graham Bell’s Aerial Experiment Association culminated with the Silver Dart taking to the skies, launching Canada’s air age. What is not as well known is that the first powered flight by a fixed-wing aircraft was matched by the rudimentary experiments in rotary-wing and vertical take off and landing (VTOL) aircraft that took place in Winnipeg in the same year. While being in the forefront of aeronautical development for a century, vertical flight development in Canada has been inauspicious and fraught with only a handful of tentative projects destined never to achieve production status. At the dawn of aviation, Manitoba was the scene of experiments and demonstrations with “birdmen” and “birdwomen” investigating flight in the form of balloon ascents and parachute flights. The next development occurred in 1909 when 25 enthusiasts gathered at the Winnipeg Industrial Bureau to form the Aero Club of Canada on March 31, 1909. Its initial, ambitious project resulted in the first aircraft designed and built entirely in Canada, the Aero Car Canada, the first aircraft designed and built in Canada. Despite its innovative design, the Aero Car Canada (or Aerocar) displayed on July 14, 1909, at Winnipeg’s Happyland Ball Grounds, was not successful. Its first flight was delayed partly by weather as well as a lack of parts that were being sent from the United States. It was not until the arrival of Eugene Burton Ely, demonstration pilot for Curtiss Aircraft who flew in Winnipeg on July 15, 1910, that the first powered flight in Manitoba was recorded. A second aircraft design was initiated in 1909 under the auspices of the Aero Club of Canada, although it was not able to proceed beyond research and design. The Kelsey Helicopter, named after its Winnipeg inventor, Edwin E. Kelsey, was revealed to the public on April 6, 1909. Described as a “dirigible helicopter”, although the design proved to be successful in scale model form, lifting into the air and flying even in a confined space, it never progressed to final construction. A further five aeronautical projects commenced by the Aero Club of Canada suffered a similar fate. In other rotary-wing developments at the turn of the century, engineers and designers in France struggled with the basic configuration of contra-rotating rotors. In 1907, Paul Cornu and Louis Brequet had both built rudimentary craft that could lift into the air, but these can hardly be considered successful designs as both suffered from control problems and were abandoned. 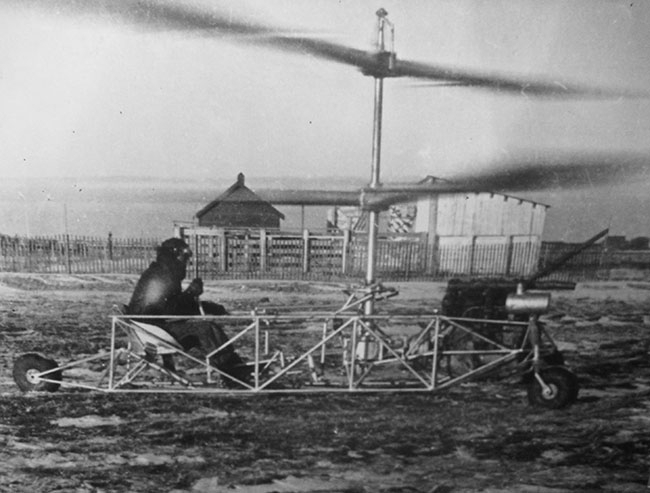 The following year, a young Igor Sikorsky in Russia experimented with a similar design but the resulting unmanned machines tested from 1909 to 1910 were only able to rise a few feet into the air. Decades later, Brequet with the Gyroplane (1935), Professor Henrich Focke with the Focke-Achgelis Fa-61 (1936) and later Sikorsky with the VS-300 (1939) returned to tackle the challenge of rotary-wing flight and create the first truly successful helicopters. Also in the 1930s, the Hess Helioplane and Duben Helicopter were unsuccessful designs unable to sustain hover or flight. 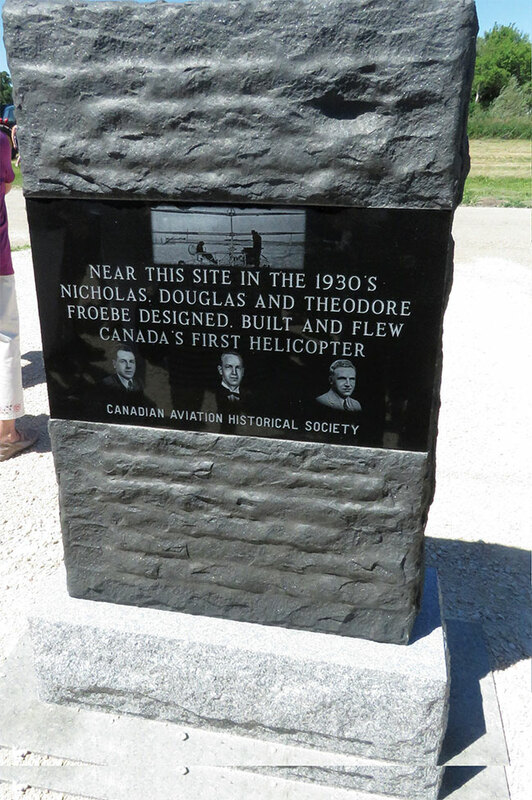 In Homewood, Manitoba, however, an almost unheralded project, designed and built by brothers Douglas, Nicholas and Theodore Froebe was undergoing testing. In 1936, using a backyard-mechanics approach, the brothers cobbled together a simple, but functional contra-rotating helicopter. The open tube frame and rotors were built from aircraft chrome molybdenum steel. Other components were either handcrafted or derived from available automotive or farm machinery. The sturdy machine utilized two concentric, contra-rotating rotor blades powered through a right-angled drive by a used 4-cylinder air-cooled, front-mounted de Havilland Gipsy engine. Although the helicopter suffered from severe torsional vibration, it easily transitioned into vertical and hovering flight, and while only flights of short duration were attempted, a total of four hours and five minutes was logged before the test flights ended on March 2, 1939. Throughout the 1940s, the Froebe brothers continued to modify their experimental design and during the Second World War, made efforts to sell their concept to Canadian and American interests, including the U.S. Navy. Gradually, they realized that more viable production helicopters rolling out of Bell, Hiller, Piasecki and Sikorsky, doomed any hope of commercial or military contracts. Despite their record of successful test flights, the Froebe brothers did not apply for a patent, with their helicopter being largely forgotten, although the original machine resides today at the same Royal Aviation Museum. In the immediate postwar years, Canada’s only certified helicopter was developed, the Grey Gull designed by Bernard Sznycer (assisted by mathematician Selma Gottlieb). Designed for Intercity Airlines with the same basic configuration of the successful landmark Sikorsky designs, the SG-IV-C single rotor prototype helicopter was designed and built in Montréal as a purpose-built machine able to withstand Canada’s harsh northern environment. The test pilot, aptly named Henry Eagle Jr., carried out its maiden flight on July 9, 1947, noting a completely vibration-free flight. After successful completion of the test program, the first production machine, SG-IV-D Grey Gull, was flown on February 6, 1948, and granted a Certificate of Airworthiness on March 15, 1951. During tests, the Grey Gull managed to fly in the most adverse conditions, with comments such as “Temperature – 10 degrees below zero. Altitude – instrument covered with snow. Wind – Terrible. Aircraft – normal in all respects.” Despite the error-free test program and glowing reports revolving around its robust construction, stability and flight control, after no contracts were obtained, financial backing was withdrawn in 1954, leading to the program’s demise. Although no other helicopters have been designed and constructed in Canada since the 1950s, three notable rotary and VTOL concepts serve as historical footnotes. The first two designs owed their existence to the Avro CF-105 Arrow project that dominated headlines of the late-1950s. In the aftermath of the cancellation of the Avro Arrow on Black Friday (February 20, 1959), engineer Peter Payne, together with a small group of fellow designers and engineers, created Avian Aircraft Ltd. with headquarters at Georgetown, Ont. Their start-up concentrated on the design and construction of helicopters and autogyros, resulting in the design of the Avian 2/180 Gyroplane. Avian Aircraft’s second VTOL project was the improbable story of the Avro VZ-9 AV Avrocar, a so-called black project that had been underway in relative secrecy while the Avro Arrow had received star treatment. One Avrocar is in storage at Smithsonian’s National Air and Space Museum and another is undergoing restoration at the U.S. Army Transportation Museum in Ft. Eustis, Virginia.